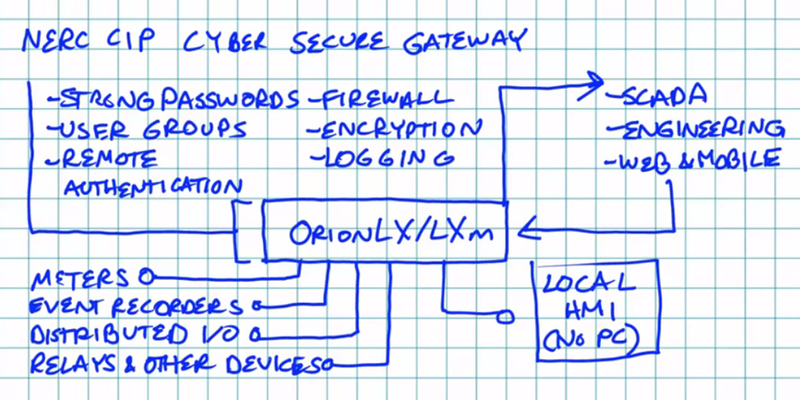 The OrionLX or LXm can serve as a NERC CIP secure substation gateway. Orion connects to substation meters, event recorders, distributed I/O, protective relays and other substation IEDs using any combination of RS232, RS485, Fiber or Ethernet connections and over 30 available IED protocols. Access to Orion and to these IEDs is controlled with comprehensive Orion security features including strong password and centralized user authentication using LDAP, encrypted protocols, key management, stateful firewall, and NERC-compliant alarm and event logging. These features provide a cyber secure connection for remote SCADA and engineering clients, and are designed to operate with open, industry-standard IT infrastructure and practices to ensure compatibility. In addition, OrionLX can present data to a local touchscreen HMI using a VGA output, eliminating the need for a substation PC and its maintenance and security requirements. The OrionLX serves as a secure California ISO remote integration gateway (RIG) in generation sites. Includes strong passwords, user privileges, firewall, key cryptography and security logging. The Configuration Backup Manager, formerly Configuration Manager Agent, is a software option available on all OrionLX CPXs and OrionLXms, and standard OrionLXs with suitable memory.